1. Preheat oven to 350 degrees. In a medium sauce pan, melt butter. Add milk and 2 tablespoons taco seasoning. Remove from heat and add potato flakes until incorporated. Press mixture into the bottom of a 10-inch pan. 2. Bake for 7-10 minutes until it just BARELY turns golden brown. 3. In a medium skillet, cook beef and onions until beef is browned and cooked through. Drain. Add Salsa and remaining taco seasoning. Cook until bubbly. 4. Pour into crust. Bake for 15 minutes, or until crust is golden brown. 5. Let cool for 5 minutes. Top with cheese, lettuce, and tomatoes. Cut and serve with sour cream if you are one of those who like spoiled cream. If I can find some potato flakes, I'm going to try this! Made this for a picnic today and it was a real hit. Had a lot of people ask for a recipe and no left-overs. This is one of my favorites. it looks easy enough that i might try it. thanks. This looks so good! I am always on the lookout for tasty appetizers for a buffet table, and I think this one will work just fine, if, instead of the potato pie crust, I use the unsweetened tart shells that I have on hand for the mini quiche that I usually make (and am thoroughly tired of making). Thanks for sharing this! Made this the other week Was good. Thanks. Have not tried this yet, but will. My husband doesn't care for taco because of the mess. But he loves shepherds pie so I'm sure he will like this!!! I made this last night. Soooo good! The crust is the best part! I just have to try this! Tacos in a potato pie shell --Cool recipe!! 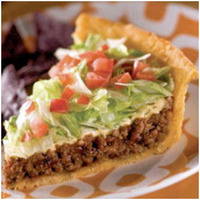 Taco Pie is so easy and quick to make. I added a can of black beans (drained and rinse) to the meat mixture to stretch it a little more. A perfect Cinco de Mayo dinner. Just tried it & its really good. Great way to use up leftover mashed potatoes. Thanks for submitting it!! Got to try! No one can go wrong with mashed potatoes and Taco fixings. The picture says it all,a satisfying,delicious meal. This was very delicious although I added my special touches to it. I added more salsa to the ground beef mixture since to me it seemed a little dry and extra cheese. I think when I make again I will make a cornbread crust. I made the pie, I used leftover potatoes they were not crunchier even after baking, the meat part was good. I am going to try using crunched up taco shells we,ll see. I really like the look and simplicity of this recipe... will definitely try it! I particularly like it when someone takes one of my recipes and makes it their own by adding things they like and exchanging things they don't like with something else. I've tried most of the variations cited in the reviews and really like them. But I still don't like spoiled cream. How do you add to recipe box? Once logged in, search for the recipe you want and go there. Near the top of the page will be a button (I think it is supposed to look like a recipe box) marked "Add to Recipe Box." Click on that button and the deed is done. Enjoy. Having this for dinner tonight!! Smells yummy!!! This looks good! I want to make it. Spoiled cream... LOL!!! But I do like spoiled cream :) so I will definitely try it. Genius... potato crust.... love it!!!! I don't cook much, but this looks too good to pass up....I MUST try it ! This looks good. I could try to try this too.